The Rebel Series takes you into another time period that can be enjoyed by young and old alike. ST. GEORGE, Utah - Jan. 13, 2018 - PRLog -- This tale will entertain those who enjoy adventure, mystery, humor and a tender love story. This series was inspired by the stories of the patriots who fought to be free from the dictatorship and tyranny of a king. Liberty is something that we cherish. The idea of a country that struggles to be free has intrigued many a reader. Missi's Book Review wrote: "There is nothing like a nice, simple love story to put a smile on your face. And that is one of the things that Linda Weaver Clarke does in her Rebels of Cordovia. She will also have you laughing out loud, make your heart race and speed up your reading! It's a story about a man that is smitten with a young lady during a time where men were complete gentlemen and the ladies were very proper. Once you start reading this book, the story will take you away. Once you stop reading, you will be shocked that you aren't actually right next to Robin in their quest. 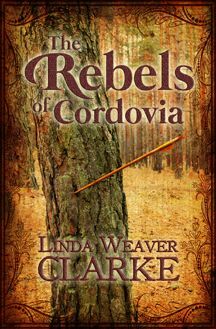 The Rebels of Cordovia is like a fresh breath of air...it's so refreshing you will want to take another breath." In this battle for freedom, a tender love story begins to blossom. Daniel, a rogue and a leader of the Freemen, doesn't realize that the sweet feminine woman he has met and is falling for happens to be the leader of Robin's Rebels. Realizing the importance of uniting all the rebel groups, Daniel tries to recruit Robin's Rebels but they refuse. Now he has to find a way to convince them. When he finds out the leader is actually a woman, what will his reaction be? Daniel and Robin Marie, an enchanting young woman, are both expert archers. With bits of adventure and delectable kisses, this tale will entertain anyone who enjoys a sweet romance. The time period is set in the late 1700s. Robin's Rebels must fight against the tyranny of a wicked king and help the people survive the oppression. In the small country of Cordovia, groups of rebels begin springing up, but its Robin's Rebels who get the attention of the king. To purchase a soft cover, an ebook, or an audiobook, visit Amazon, Barnes and Noble, Audible, or the author's website. Linda Weaver Clarke is the author of historical romances, a mystery/adventure series, a romantic cozy mystery series, and a children's book. All her books are family friendly. Read sample chapters and buy her book at http://www.lindaweaverclarke.com. Award Winning Novel is an Instant Classic! Is It Possible To Only Have One Last Dance? The Roaring Twenties - A Time of Change and Independence! Historical Romance Reflects the Mood of the "Roaring Twenties"